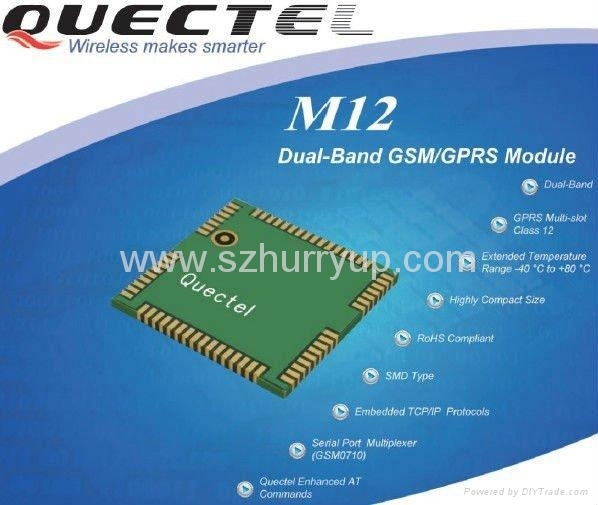 The M12 is a dual-band GSM/GPRS wireless module in SMD type. It is pin-to-pin compatible with the M10 quad-band module. The M12 can be embedded in customer applications, offering good reliability and robustness. and Fax in a small form factor with extremely low power consumption. With a tiny configuration of 29mm x 29mm x 3.6mm, the M12 can fit into almost all M2M applications, including VTS, AMR, Wireless POS, Security, etc. Featuring an industry-standard interface, the M12 deliv-ers GSM/GPRS 900/1800MHz performance for DATA, SMS, Fax and Voice in a small form factor with ex-tremely low power consumption. With a small configu-ration of 29mm x 29mm x 3.6mm, the M12 can fit into almost all M2M applications, including VTS, AMR, Wire-less POS, Security, etc.